It’s been a while since I found myself in Westmore, mistakenly know as Willoughby due to the overwhelming presence of that beautiful liquid gem. But recently my husband and I made our way to a little restaurant with a lot of personality that just happens to have one of the best views of Willoughyby Gap. It comes as no surprise that this is why the restaurant is named The Gap. For many years this was the location of Robin’s Roost, and a variety of other bars. But The Gap has been going steady for a few years now and the atmosphere of the place has totally changed. I hadn’t been here since The Gap opened, so on walking in I was immediately struck with the new layout (well new to me). What was once two separate spaces, a dining room and a bar room, is now one – allowing for cohesiveness and the feeling of openness. Wood floors throughout make the space seem like one room, as does the rustic décor. We went just before Christmas, and I was delighted to see tasteful lights and holiday decorations that made the space festive without being over the top. 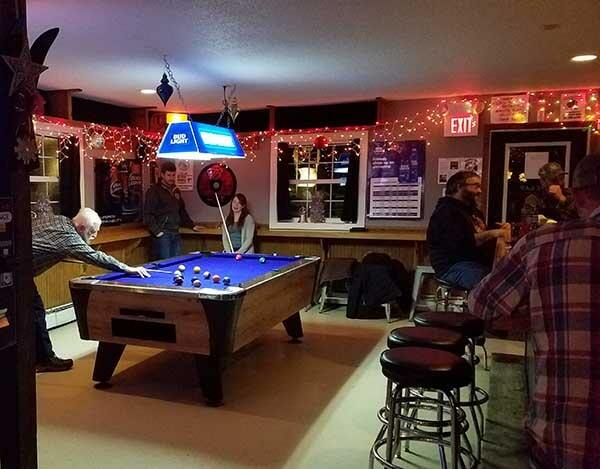 We had come for karaoke, but I was happy to see that the bar side was filled with people eating and talking, the pool table surrounded, and a group of what seemed to be regular customers all having a good time. People at the bar bantered with each other and the bartender. A guy at one end of the bar called to someone at the other end by name, and proceeded to have a loud conversation across a group of people, a few that chimed in along the way. As I stood up to the bar to order a drink, a man offered me his seat with a smile. I politely declined as I was heading over to a table, but the gesture was appreciated. This is definitely the local watering hole, and upon walking through the door the place feels welcoming. Like most local bars and town diners there is a sense of community and place that takes the whole experience to another level. 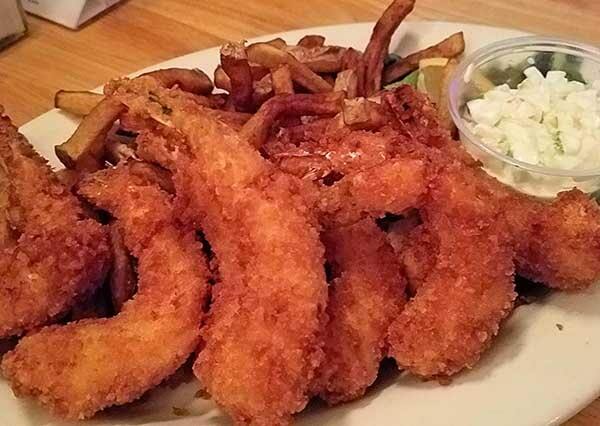 The Gap offers a tavern style menu, filled with great appetizers, sandwiches, burgers, salads, and fried seafood. There is nothing fancy about the entrees, but from what we experienced, all of the food is prepared with quality in mind. I can’t pass up trying poutine at any new establishment I dine in. It really is one of my favorite junk foods, and it is a local/regional staple. So, of course I had to order it at The Gap. A healthy portion of hand cut fries arrived at the table, covered in thick gravy. For me that is a must. This gravy wasn’t overly salty, and though I wasn’t able to ask if it was house made or a premade item, the overall quality was good. 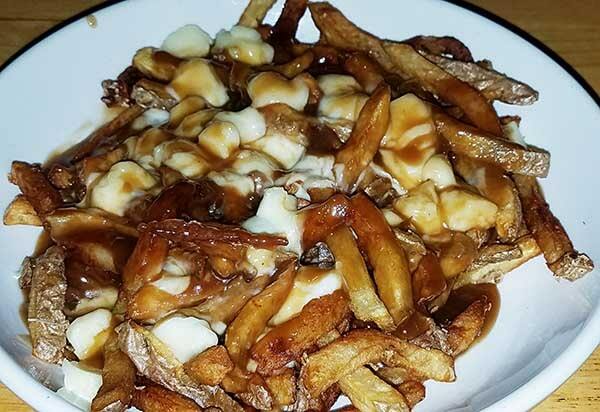 Now, if you are a poutine veteran than you know that people have their preferences for cheese curd – some like small curd, others large; some want it served slightly melted, others like it cold and on top of the hot gravy; some people like sour cheese curd, others a more mild flavor. This curd was more sour than I like, but was good none the less. In fact, I was so happy with this poutine that I ate it all and only sampled my main entrée. My husband got an order of wings.. The dish came with 8 wings well coated in tangy Thai Chili sauce. I took a bite to give them a try and found them super crunchy. The sauce had flavor but came with a kick that was too spicy for me. My husband was happy with the heat and that the wings kept their crunchy texture. For entrees we ordered the Willoughby Burger and the fried shrimp. The burger came with applewood smoked bacon, caramelized onions, cheese, and bbq sauce. It was cooked really well, a perfect medium, and held together nicely. The shrimp were large and sweet, and fried to a nice crisp without being greasy at all. They could have used a little salt, but the batter was good. 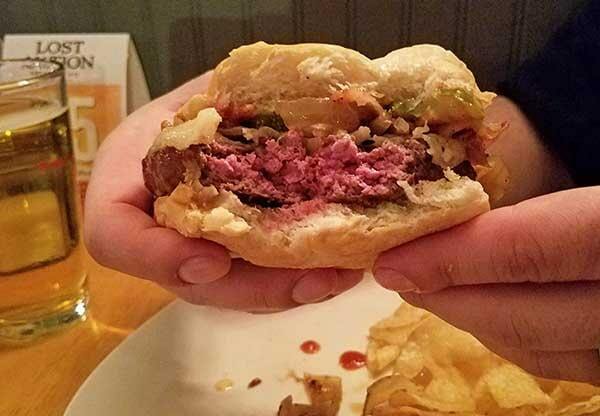 This came with a side of coleslaw, which had onion and seasoning in addition to cabbage, carrot, and a little mayo. Both entrees came with a good helping of fries. Overall, we were happy with the food. Everything seemed to be well made and had good flavor. The menu has a lot of options, and while it focuses on pub fare many items are prepared fresh which improves the quality and makes for a tastier experience. 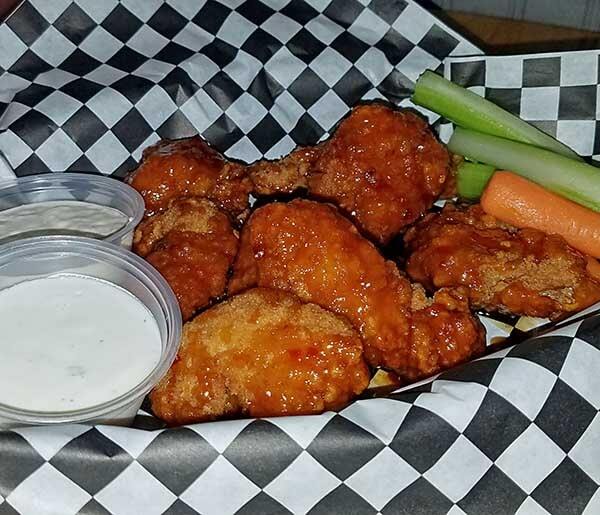 In addition to burgers and wings, they also have a Prime rib club, buffalo chicken sandwich, an avocado BLT, pulled pork, Philly Cheesesteak, salads, fried seafood options, and plenty of shareable apps like pot stickers, nachos, calamari, and fried green beans. On this particular visit, we came for the karaoke, but we’ll be back to check out their summer offerings and the beautiful view that sits right outside their windows.